The discovery of the HAMMURABI CODE is one of the greatest achievements of archaeology. THE HAMMURABI CODE is of paramount interest, not only to the student of the Bible, but also to all those interested in ancient history. This document carries us back to gray antiquity; to what was once regarded as prehistoric times; to a period long antedating the promulgation of the laws of Moses. 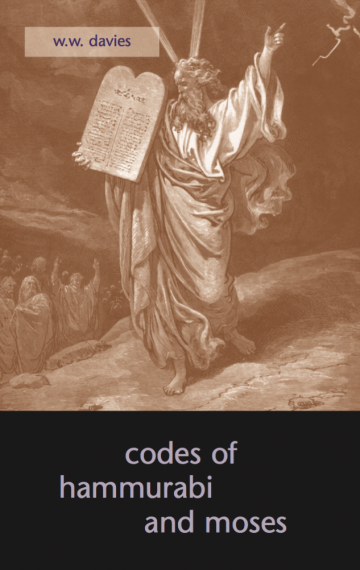 The astounding information that a long code of laws, dating back to a time nearly one thousand years before the age of Moses, had been discovered produced great excitement among Bible students the world over. The Code was written on a rude piece of black diorite, nearly eight feet high, and more than seven feet in width. Both sides of the monument are covered with writing. This classic translation into English, made by W.W. Davies, is now available from The Apocryphile Press.